There are countless ways to get rid of ants. Ideally, you want to kill them. Killing ants is a sure fire way to really get rid of them. The question is, what is the most effective way to kill ants? You could squish them. That usually kills them. The problem with squishing them is that you only kill the ones that you see. There are a few things that you need to know and understand if you really want to know how to get rid of ants effectively. Here at BoraxAntKiller.com – we have a really sweet solution that works amazingly well! And by sweet – we mean that literally! The best part about our method for getting rid of ants – it’s 100% natural and you probably already have the ingredients in your home. That’s right. You can make your own homemade ‘borax ant killer’ today! We are confident that you will find that this is the very best and most effective method for how to get rid of ants naturally. Take a quick glance at our infographic below. It spells out everything simply and visually – including detailed step-by-step instructions. And below the infographic we are happy to provide even more detailed and complete information and instructions. Feel FREE to save the image file for this infographic and post it on your own website or blog- as long as you link back to this page or any page on boraxantkiller.com to give us credit. Ants live in colonies. There is no such thing as a rebel or renegade ant that is out going it alone. Fending for itself. Nope. If you see a single ant, it is likely out searching for a food source to either bring back to the colony or to bring the colony to in order to feed. You could squish this single ant and kill it, or spray it with an ant spray that kills instantly. But in most cases this won’t take care of your ant problem. The rest of the ants in the colony remain and eventually they will come out and search for food. You need to kill off the entire colony (or colonies) in order to rid yourself of those pesky ants. How to get rid of ants most effectively is to kill the queen ant. Typically, the queen stays in the nest and her sole purpose is to reproduce. She continually lays eggs for reproduction while the worker ants tend to her every need. They bring her food and dispose of her waste. If you kill the queen, there will be no more reproduction in that nest. Eventually, the rest of the ants in that nest will meet their fate and then that colony will be dead. So, how do you kill the queen if she never comes out of the nest? You poison her! And how do you get the poison to her if you don’t even know where the nest is? You let the worker ants bring the poison to her. And why would the worker ants bring poison to their queen? Because you trick them and make them think it is a food source. This really works. The worker ants bring the poison to the queen. She eats it and dies, hence stopping the entire reproduction within that nest. The rest of the colony also eats the poison and dies. If any escape, they follow the trail to the food (poison) source and eat it there and die. You could use one of several store bought poisons to attempt to control your ants. If you were going to do that though, you wouldn’t be on the internet searching for alternative ways to get rid of ants. You’ve come to the right place, because we’re showing you exactly how to get rid of ants naturally and effectively by mixing your own borax ant killer. Lastly, I would advise against using store bought sprays or other poisons that kill ants on contact. If you’ve read the rest of this page, the reason is obvious. Dead ants can’t bring poison back to their queen in order to kill off the entire colony. 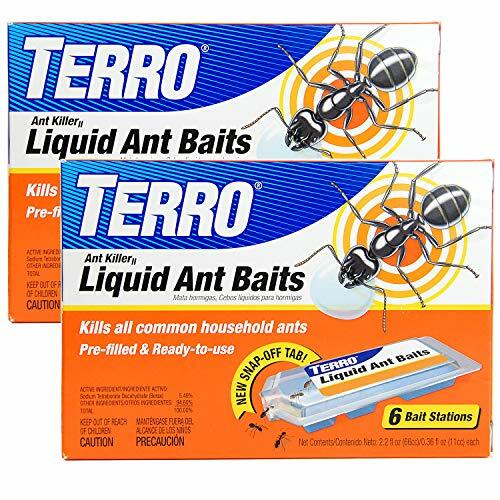 While these sprays can be an effective tool to create a barrier that prevents ants from coming into your home (or other building or structure), they are not effective at killing off entire ant colonies. Unless, of course, you know where the nest is and can spray directly into it. First of all – you need to know or be sure that you actually have an infestation. An infestation can be defined as being completely invaded or overrun by pests. You might notice hundreds or even thousands of ants if you are being overrun by an infestation. If this is the case – it is possible that there are several nests and the ants might be reproducing faster than you’ll be able to kill them off with a simple homemade borax ant trap. You may want to consider calling in a professional exterminator if you have a full blown ant infestation. It’s actually really easy to get multiple price quotes for exterminators in your area. And it only takes a minute to get started! Although – it wouldn’t hurt to place a few borax ant traps in the meantime. These homemade borax ant killer traps might be effective for killing off entire infestations. You won’t know unless you try. The infographic above already contains pretty good and detailed instructions. And it is a somewhat newer feature of our site. Although, we do have slightly more detailed instructions and pictures on our original ‘Step-by-Step Instructions’ page.